I’ve been a good girl. I’ve been cleaning out my freezer. People keep telling me I just need to buy a second refrigerator/freezer, but I can only imagine how much more food I could potentially squirrel away and forget about if I had two freezers. No, it’s good to rediscover those little gems squished alllll the way in the back corner while they are still recognizable and consumable. 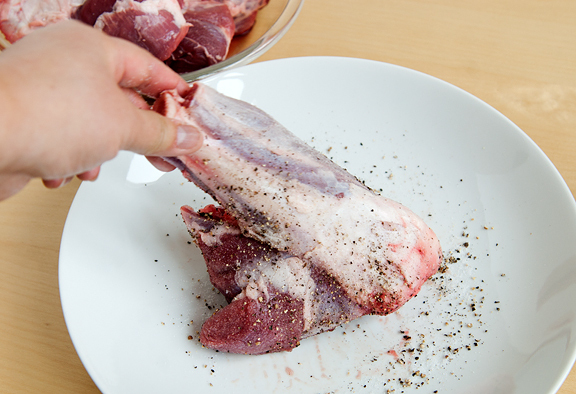 So when Lava Lake Ranch shipped me some of their beautiful 100% organic, grass-fed lamb cuts earlier this month (FTC disclosure), I was determined to use the largest pieces – the shanks – first, to keep the volume of frozens down in my freezer. As luck would have it (or negligence, you pick) there were two more hind shanks from Lava Lake buried under several bags of green chiles on the lower shelf. Four shanks in total… sweet. 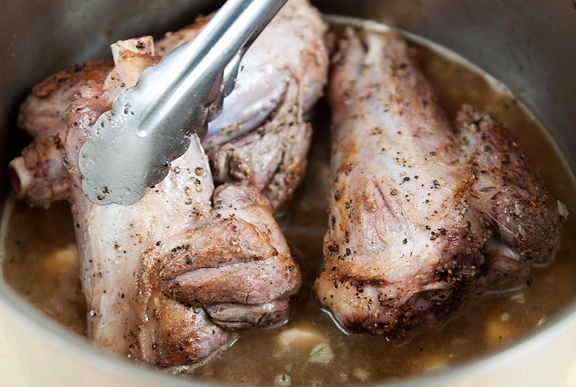 Knowing next to zippo about lamb, I asked the twitterverse if I should braise or roast the lamb shanks. Overwhelmingly, the twitterverse replied BRAISE. Lately I have had a hankering for lentils and thought what better way to enjoy the lamb than with lentils? Not to mention, there is nothing quite delightful as a slow-braised dish on a cold evening in the Colorado Rockies. So here’s the odd bit about this post… I can’t reproduce the recipe here, but I can list the ingredients and I describe what I did to make it. You can always head over to the Seattle Times for the original (but they don’t have pictures). The first step after preheating the oven to 350°F was to sear the seasoned lamb shanks in a little oil on high heat in a Dutch oven. Searing all sides took about ten minutes for me, but it was worth it for the fond (that lovely brown crust) you get on the bottom of the pan. That’s the good stuff. That’s the FLAVOR. After removing the shanks to a plate, I had to add a bit more oil to sauté the onions, garlic, herbs, and spices. According to the recipe, I was supposed to have lamb fat left after the searing, but this lamb is pretty lean (either that, or I trimmed all of the fat before searing – it’s not like I know what I’m doing here). When the onions softened up, I added the amber ale and the chicken broth to the pot. 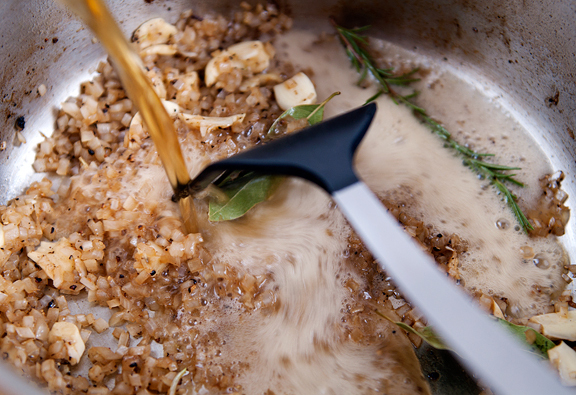 Be sure to stir it about and dissolve the fond from the pan. Remember what I said about FLAVOR? 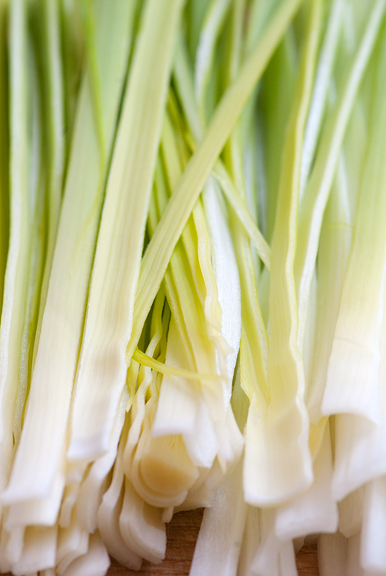 Not only does it give your broth great flavor, but it makes cleanup so much easier. Once the liquid came to a boil, I placed the shanks back into the pot, put the lid on tightly, and set the whole thing in the oven for 90 minutes. 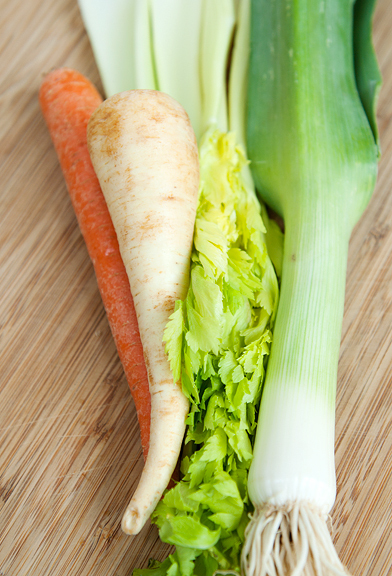 While the lamb shanks were braising away in the oven, I fine diced the vegetables: parsnip, carrot, celery, and leek. Personally, I would double the amount of vegetables the next time – they’re so very wonderful. I’d probably increase the amount of lentils too. It’s a meaty dish, so I tend to prefer a balance with more of the non animal ingredients. After 90 minutes of braising (and hey, maybe it’s my elevation, but I think I’d let it braise for two hours) I took the pot out of the oven, removed the shanks, and strained the remaining liquid. The solids get tossed out. I let the broth cool for a few minutes before using my favorite de-fatting trick which involves a gallon ziploc bag, a knife, and careful timing. Works every time! 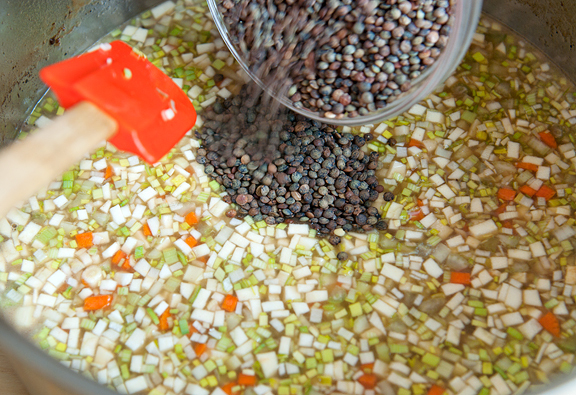 I poured the broth, vegetables, and lentils into the pot and brought it all to a boil. Then I added the lamb shanks, covered the pot, and placed it back into the oven for 15 more minutes (which in hindsight, should have been another 30 minutes for my elevation to help the lentils along). At that point, the lid is removed and the pot stays in the oven for another 20 minutes to brown up the shanks. The heady aromas emanating from the oven were so distracting. I mean come on – beer, onions, garlic, lamb? This dish is worth the wait, that is, if you like falling-off-the-bone tender lamb in a rich, complex, and deeply satisfying broth with earthy lentils and sweet root vegetables. The perfect winter dish and elegant enough for the holidays. Follow the link above for method. Love your pictures. The lamb looks just luscious! I love lamb and the combination with the lentils is great. 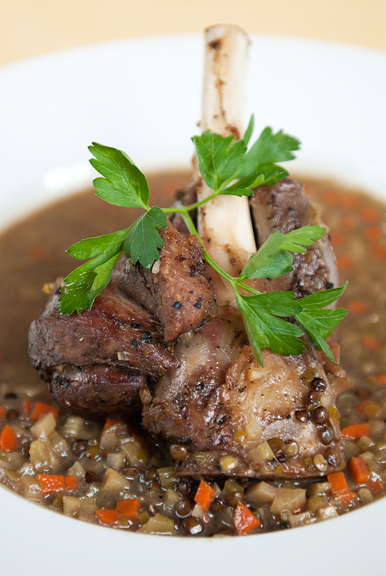 The texture of the firm Le Puy lentils must be a great contrast to the melt-in-the-mouth lamb. Lovely dish! I love lamb shanks. I am not a huge meat eater but lamb shanks make me weak in the knees. Thanks! Marvelous- there is nothing more delicious or comforting in winter than a hearty lamb shank dish. These look fantastic. Whoooaaa. Now that’s my kind of meal! 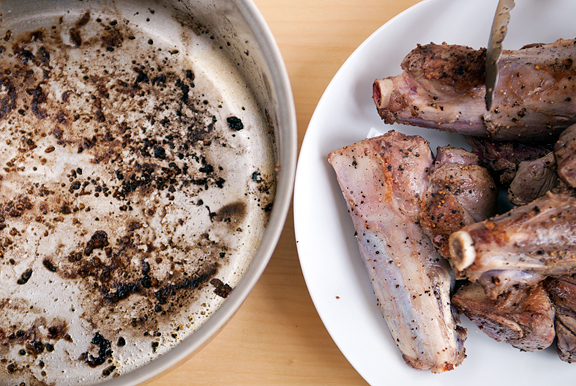 Gives me one other reason to yell at my parents for getting rid of sheep and getting goats instead – braised goat isn’t nearly as tasty as braised lamb! WOW! Could you please for once make something that doesn’t make me want to lick the screen and/or stab it with a fork? I have only cooked lamb once, but this looks like such a common sense approach that I think I could handle it. Need to go ahead and make this while it’s still chilly here in Florida. ahhhh…jen…i am so glad you didn’t leave us for the winter! your food – EVERYTHING you make – is like is what i call “boulder crack”! i will make this for xmas eve. 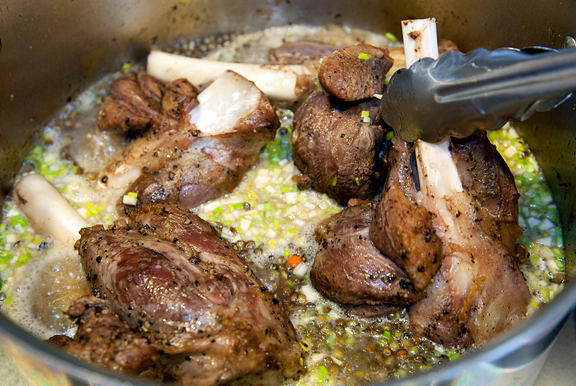 jen, braised lamb shanks are one of my favorite things in the world, and i love the idea of preparing lentils with it. I usually do lamb shanks in the crock pot, but wow. I might have to try this on the stove. That’s gorgeous! I’ve still not cooked any lamb that wasn’t ground, I don’t know why I’m so nervous about it. I guess our food budget is so tight that I’ve been hesitant to buy meat I’m not sure how to cook, but you inspired me. I’ll buy some lamb for our Christmas Eve dinner! Wow, lamb shanks have never looked so good! 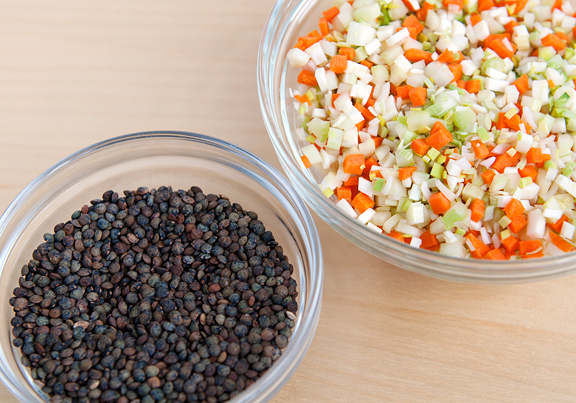 Love the pairing with lentils. I’ll have to try out this recipe over the holidays. Fans of Use Real Butter, try out our lamb shanks and other cuts of sustainably raised grass-fed lamb and use promo code LLLblog12 to save 10% off all orders over $150. All profits go towards conservation projects on our ranch, so you can purchase knowing you are supporting a good cause. This looks so goooood! Love lamb shanks. Love lentils. Have lamb shanks in my over-full freezer which also needs cleaning out, and have lentils. I think I see this dish in my near future! That looks great. I never made lamb before. Lovely lovely recipe! I made it for xmas dinner and I can’t gush about it enough. There were only 2 of us, so I only used 2 large shanks and swapped celery root in for the parsnip. I can’t believe how delicious the broth was, the beer really took the flavor up a notch. This is my new favorite recipe. Caitlin – ha ha! I have never had goat before ;) But the lamb is indeed quite amazing. Kerry – I don’t eat lamb often, but I have to say this is the best lamb dish I’ve ever had. I love it. DianasaurDishes – just make sure you braise the shanks until they are super tender – I think that’s the trick :) Hope you enjoyed it! iconicblue – sounds great. 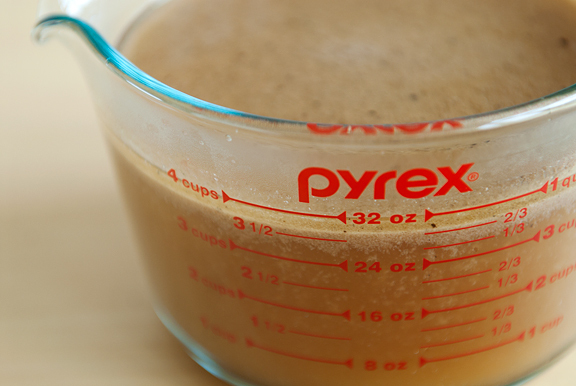 I agree – that beer makes the broth! I know next to zippo about lamb too and I have had a very good one in a local bistro before and no where else I have eaten at is good enough. I will love to try making with the recipe you posted when I get a chance! Made this last night. Kept close to the recipe, added some thyme because I have a lot of it growing. My super picky G/F said that I have to make this dish again. I agree, very, very good. The broth is fantastic. Thanks for the recipe. 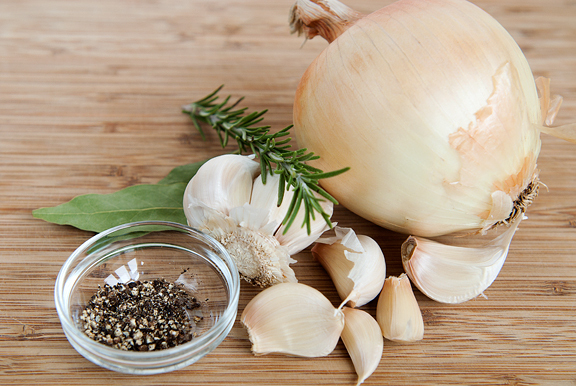 Making this tonight…..and wondering what else to serve w/it. Thoughts? Helen – How about roasted cauliflower and a green salad?